Sandy Key's beaches are forever protected by the neighboring National Seashore Preserve. If you prefer your walks on the beach, solely in the company of the seagulls, Blue Herons and seashells, then Sandy Key is the place for you. Sandy Key, a gated community, is located on 800 feet of Beach Front. Amenities for your enjoyment include 2 swimming pools (one geothermal heated), lighted tennis courts, fitness center with sauna, grilling areas, two elevators per building. Three buildings offer either two bedrooms, two bath units or three bedrooms, two bath units. Balconies are large and 200 Square Feet. Who knows, you may be lucky enough to spot dolphins frolicking or a Blue Angel fly by! 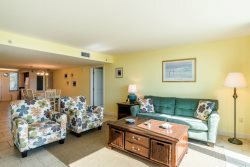 Browse our condo vacation rentals to find a place that's perfect for your stay.